We want to show that Tiverton is a fantastic, vibrant and eclectic mix of shops.. We are very lucky with a wide range of retailers. We know that there are a number of empty larger shops in the town but this is due to national issues and not specifically because of issues in our town. We are the largest town in Mid Devon and with rising fuel costs it makes sense for people to use their nearest town. Rural residents need to be enticed (and reminded) how great it is in Tiverton. 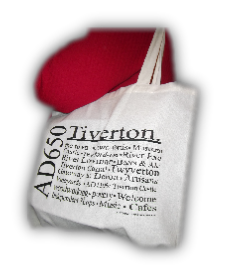 Firstly, we are thinking about having a Tiverton Shopping bag. We don’t think carrying a card is going to work...in other towns they get too complicated to manage. Ours is simple. Use the bag in town and get access to special offers that the shops provide. Each shop will have offers for you throughout the year. E.g. buy a loaf and a couple of pasties and get a free cake. Or buy lunch for two and get a free coffee. This is in the early stages, we have trialed the bag design by getting 250 bags (see pic) and having those in 11 locations. They have all mostly gone.